When a massive storm hits, houses are destroyed, cars are flooded, and lives are forever changed. 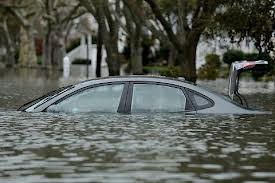 According to the Huffington Post, over 230,000 cars were damaged by Hurricane Sandy, which tore apart the East Coast last year. That is a whole lot of cars that can no longer be used. So what happens to these cars? Most of them are inspected by the National Insurance Crime Bureau (NICB) to determine how severe the damage is. They will then determine if the car should simply be crushed, sold for parts, or sold in its current condition. If the car is sold, its VIN number is entered into the NICB’s VINCheck system with a clear note that the vehicle was damaged during a storm. Is there a chance I could be tricked into buying one? The short answer is yes. Since so many cars are damaged, it is impossible for them to all be controlled and sorted by the NICB. Dishonest car dealers and private sellers will try to salvage the cars and not report any damage on the cars’ titles. How do I know if a car has been damaged by a storm? You have to be savvy. For starters, try to only purchase a car from a reputable dealer. The small shops and private sellers are usually the ones to look out for. You can also check for any water stains or mildew on the carpets or cloth. Look for rusty screws or mud or grit in places it shouldn’t be (spare tire compartment, crevices in the engine, seatbelt retractors). If the car was just shampooed, this could be a sign they are trying to cover up the smell. Always check a car’s title for anything out of the ordinary. Ask the dealer questions about the car and expect quick, accurate answers. It is also a good idea to have a mechanic check out any car before you buy it. Above all, trust your gut. If something is telling you the deal is too good to be true, it probably is. Run and don’t look back. Paying a little bit more for a comparable car is always a better option than being stuck with a vehicle that was damaged by a storm.